A few months ago a co-worker of mine was leaving the company so we did lunch at Bar Bacon. Someone ordered a Redkorderlig Pear Cider, let me have a sip and I have been hooked since. I had never heard of alcoholic cider (no I am not sheltered haha) let alone a pear one! Me not being a huge drinker this is a perfect drink for me. The alcohol content is not very high at 4.5%, and it is DELICIOUS. This cider is of Swedish heritage. I am not sure if it is imported from Sweden though. 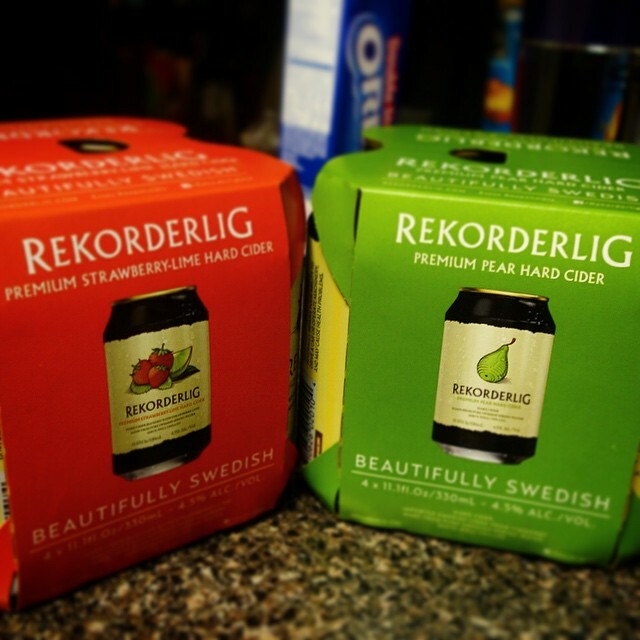 Rekorderlig makes a few flavors, but out of all of the ones I have tried, the pear one is where it’s at. It is not too sweet, but not too bitter either. It is refreshing and delicious. The strawberry-lime one would be second place for me. I would like to try the spiced apple flavor… hopefully I can find it! To be honest, I have a hard time getting my hands on these flavors alone. Since trying Rekorderlig I have have been drinking strictly cider whenever I am going to have a drink. I don’t like beer, but this makes me feel like I am drinking one along with everyone 🙂 Beautifully Swedish indeed!